Have you ever noticed that some of the best inventions tend to be based on the simplest ideas? Think of a paper clip. It’s just a piece of metal bent into a racetrack-shaped spiral. But it’s cost effective, easy to use, and comes in handy at the office every day. OBEX cubicle panel extenders have the same appeal – and for the same reasons. They offer a sensible alternative to purchasing new, taller cubicle panels when you need to create more privacy for employees. Installation takes about 5 minutes and workers will appreciate the noise-dampening effect instantly. Over the past decade, there’s been a trend in the office furniture industry toward creating a more “open” work environment. This includes choosing workstations with low panels that are supposed to increase a sense of teamwork and collaboration. In some situations, this type of design works just fine. However, like all fads, it doesn’t serve all participants equally well. In fact, some employers and employees are finding that this trend is actually counter-productive. 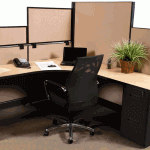 Cubicles have long been the mainstay of acoustic control in the workspace. Doing away with high cubicle panels in favor of more openness also means losing this important tool for managing noise levels. As the volume goes up, it becomes more and more difficult for workers to remain on task. It’s becoming increasingly clear that being able to hear everything around you doesn’t necessarily enhance collaboration or communication. Instead, it just makes it more difficult to focus on getting the job done. Maybe you were sold on the idea of low cubicle panels by an office furniture dealer eager to help you create a “modern” looking workspace. Or, perhaps you inherited a set of workstations with low panels from a previous facility manager and didn’t have a choice in the matter. Either way, there’s no need to buy a completely new set of cubicles to fix the problem. Instead, you can easily retrofit your existing workstations with 12” or 24” high panel extenders to reach the correct height for maximum noise control. These extenders are available in widths from 24”-66” with universal brackets for thicknesses up to 3.75” to fit all standard cubicle panels.